In 2012, Audi upgraded its London showroom from a traditional all analog concept to an innovative digital cyberstore. 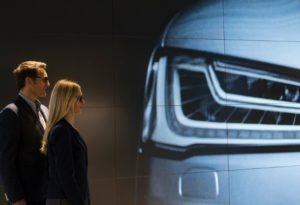 This move boosted sales in the store by 60% confirming Audi’s theory that there is room to drive sales in urban showrooms by expanding options to customers and offering more tangible tailored experiences. The Audi City concept was born and since then 5 other digital showrooms were launched in major urban centers: Beijing 2013, Berlin 2014, Istanbul, Paris and Moscow 2016. In most urban centers, car showrooms have always been constrained by space leading to a limited display of models. 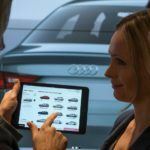 These stores’ floor area are barely 1/3rd of the area in classic dealerships at an average of around 400 sqare meters.The Audi City concepts bypass this limitation by leveraging digital technology. Specifically, virtual reality used in showrooms enable the display of entire car models catalogues. In combination with top-notch consultations, the stores thus offer customers a hands-on tailored experience. This blend of digital and analog creates a fun, efficient and enriching experience that facilitate decision making, and increase confidence in purchasing decisions. The cyberstore, uses the latest concepts of architecture in combination with the latest digital trends to produce multi-touch tables, tablet-user interfaces and powerwalls. Customers can seamlessly customize vehicles and configure it in full size on the powerwalls and then zoom in to look inside their vehicles for detailed investigations. Customer can watch the vehicle drive off or even open the door all whilst listening to authentic engine noises. Its sophisticated sound system direct the noise so that only specific customers can hear it enabling an open space without segregation. Through a centralized server, all the Audi City stores are fed with the latest product information, marketing campaigns, visualizations options and news. Customized experiences based on local cultures and trends, or more specifically customers backgrounds are also easily enabled. With just a few clicks, the content of the virtual displays and presentations can seamlessly be adapted. Customers who are deemed serious buyers are invited to one of three customer private lounges for personalized sales consultations. Each lounge is equipped with its own mega screen and multi-touch table. Also, another separate lounge is reserved for the handover of vehicles to owners. The Audi City concept not only drive sales by enhancing the customer experience, but also by decreasing cost of operations. Only a handful of physical cars are needed in the digital stores thus decreasing significantly storage cost. In the London store an average of 4 cars was enough. By redefining urban showrooms, Audi was able to dazzle customers all whilst driving sales and decreasing costs – definitely a winner in the digital era. There is a hope in automobile industry! This luxury experience could be further enhanced through virtual reality head-sets like Microsoft Hololens or HTC Vive Pro, and even virtual assistance offered by companies like gramLabs. Such additions could offer an intimate experience inside the car, interactive elements, and be suitable for smaller showrooms, outside of the biggest cities of the world. 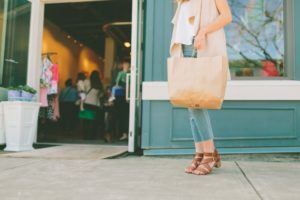 This is a really interesting use of technology to drive retail sales in a smaller footprint. I would love to see how this technology could be applied to other retailers of items such as fashion or furniture so they can reduce their inventory carrying cost, real estate investment, and improve customer experience to better compete with online retailers. This is a really interesting way for a car manufacturer to interact with potential customers. 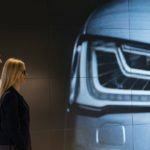 Before reading the post, I would have thought that physical interaction with the car was important for customers in order to finalize a sale, the Audi case shows that for many that is not the case. My concern about this model, though, is the effect of the experience on customers that value the driving experience and need the physical interaction. 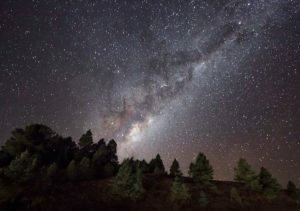 Will digital technologies one day fully replicate the experience? I think that for brands with a value proposition centered around driving, this may prove to be a significant challenge.